The road will turn and life will always be a coloring book. That might not make sense to you but if you look hard at this painting, you'll understand what I mean. Look at how much color surrounds you. Life is full of winding roads, bumps along the way, and significant curves. The Turning Road, L'Estaque is a 1906 multicolored painting by Andre Derain (French, 1880-1954). Hanging in the modern collection of the Museum Fine Arts Houston, this landscape painting represents the Southern French village L’Estaque. When I first look this, I can't quite tell what to make of it. I am dazzled and overwhelmed. It evokes some wonder. I know that Derain took in this scene from observation because it was a popular place to paint around this time. Artists like Cezanne and Braque were also known to paint here. I like to imagine him painting at the top of a hill looking down at the road. But I don't think this painting is purely a landscape scene, it also represents everyday life with a colorful figurative touch. A road travels across the canvas. People are working, carrying water buckets, riding horses, and lying down in the sun. 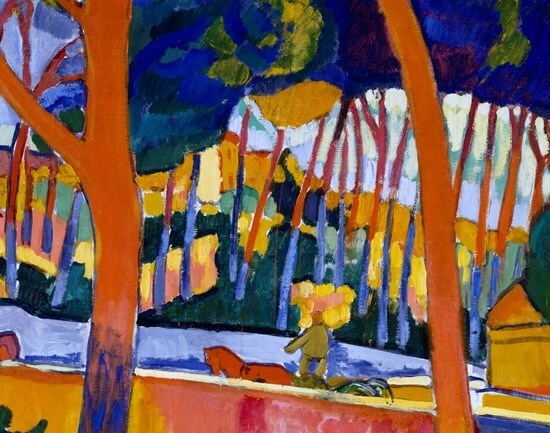 Fauvism, a movement described as unnatural and too vivid, was one of the first movements to break from the Impressionism technique. 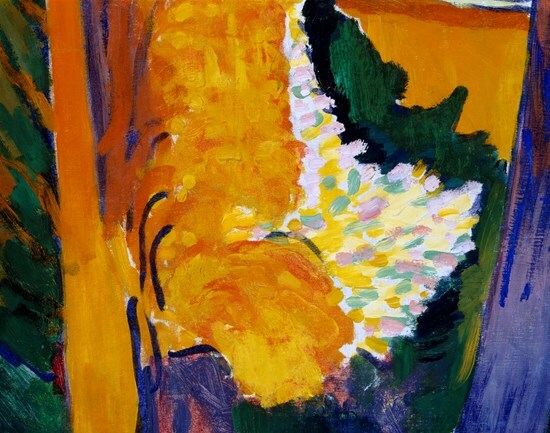 Known for their short time together, the Fauves (French for "the wild beasts") created an alternate outlook of naturalism with the flat placement of contrasting colors. These eye-catching colors invite the viewer to explore the world in a different perspective. Andre Derain was one of the youngest members of the Fauves and shared an artistic collaboration with Henri Matisse. Derain took in the boldness of Matisse’s liberal color and drawing techniques. They influenced each other’s styles and shared ideas. The Turning Road, L'Estaque certainly belongs to the Fauvism movement because of the vast amount of color used and Derain's involvement with the ideals of the group. What makes this painting truly unique is the style. In his foreground, Derain used an abundant amount of thick lines to depict the tall, twisted, curved and straight trees. In the background, the curved winding road is the central direction of the piece’s composition. This is a crowded painting that captures definition and structure with its busy presence. Depth is shown by the foreground, middle ground, and background. Derain divides his piece up into three elements and then combines all efforts into this swarmed portrayal. Without the opposing curved road, one could focus too much on the trees. The shapes he creates with these flowing lines are outlined with the contrasting colors. The viewers are reminded of their shapes because Derain changes the color of the objects in their figure. Subjects aren't depicted in much detail but that isn’t to say that the viewers aren't capable of realizing they are in fact human. There is not much geometry involved, nothing static or strict. It is merely what would be considered a flowing or continuous picture that is truly captured by bold color. This is a bright colorful French painting. The most critical aspect that I'd emphasize is the color. Some important details that one could miss if they weren't critically looking at the painting are the people at the bottom by the flowing water and the horse that is carrying the wagon. The sense of light is shown through color. The three dominant colors Derain uses are primary. The yellow paint acts as a natural sunlight source for the village and doesn't overshadow the other colors. The trees reflect the sun with a flamed orange paint that would be natural with a sunset. The shadows are shown with dark blue, violet and navy colors. This shading is visible in the trees but it also serves as a gentle blue water source. With all of these stylistic qualities, Derain sets a positive outlook and mood for the viewer. This painting is a rare masterpiece and an excellent example of Fauvism at the Museum of Fine Arts Houston.